Would you make a good dental hygienist? Take our career test to find out how you match with this and over 800 other careers. 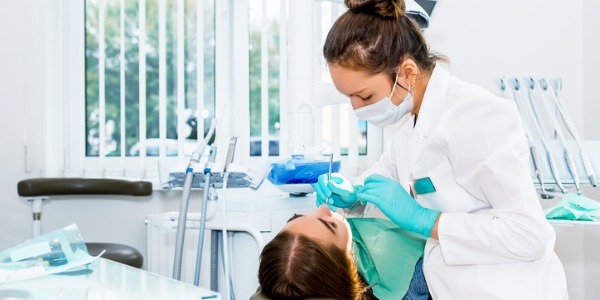 What is the workplace of a Dental Hygienist like? 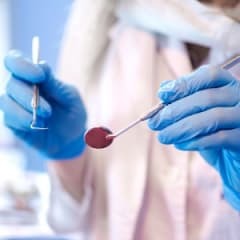 A dental hygienist is someone who cleans teeth, examines patients for oral diseases such as gingivitis, and provides other preventative dental care. They also educate patients on ways to improve and maintain good oral health. Almost all dental hygienists work in dentists’ offices and work closely with dentists and dental assistants. A dental hygienist uses many types of tools to do their job. They clean and polish teeth with both hand and powered tools, as well as ultrasonic devices. In some cases, hygienists remove stains with an air polishing device, which sprays a combination of air, water, and baking soda. They polish teeth with a powered tool that works like an automatic toothbrush, and use x-ray machines to take pictures to check for tooth or jaw problems. Dental hygienists help patients develop and keep good oral health. They may explain the relationship between diet and oral health. They also may give advice to patients on how to select toothbrushes and other oral-care devices. Sometimes patients are in extreme pain or mental stress, and the hygienist must be sensitive to their emotions. Dental hygienists must follow specific rules and protocols to help diagnose and treat a patient. In rare cases, dental hygienists work without the direct supervision of a dentist. Dental hygienists must be good at working with their hands. They generally work in tight quarters on a small part of the body using very precise tools. Dental hygienists should be comfortable performing physical tasks, such as bending over patients for a long time. Dental hygienists must understand how to operate complex machinery, including x-ray machines and powered instruments. Are you suited to be a dental hygienist? Dental hygienists have distinct personalities. They tend to be social individuals, which means they’re kind, generous, cooperative, patient, caring, helpful, empathetic, tactful, and friendly. They excel at socializing, helping others, and teaching. Some of them are also realistic, meaning they’re independent, stable, persistent, genuine, practical, and thrifty. Does this sound like you? Take our free career test to find out if becoming a dental hygienist is right for you. Almost all dental hygienists work in dentists’ offices, which are clean and well lit. They work closely with dentists and dental assistants.